While a fierce MVP battle rages on, wives and girlfriends of star NBA players are bound to sit courtside as the 2017 playoff season commences this weekend. The Golden State Warriors finished first in the Western Conference, going 67-15 in the regular season. 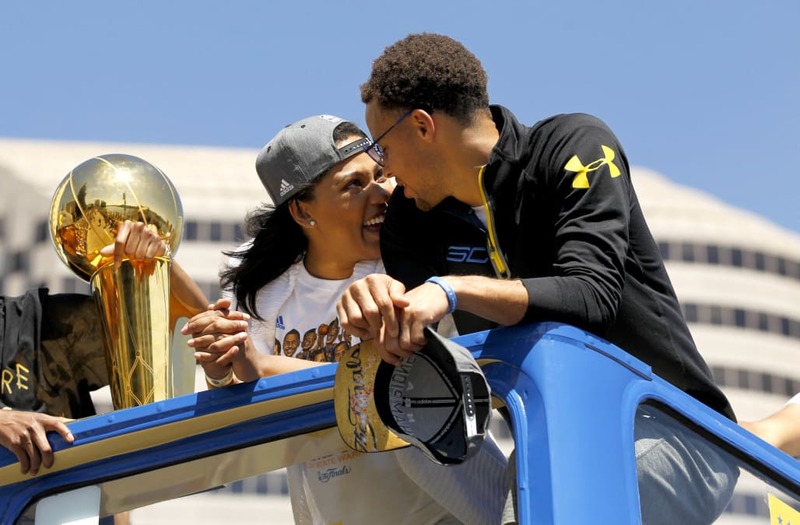 Star point guard Steph Curry will likely be cheered by wife Ayesha Curry as fans and analysts ponder the potential for a repeat of the 2016 NBA Finals featuring head coach Steve Kerr's Warriors and the reigning champion Cleveland Cavaliers. The case has been made for LeBron James as this season's MVP, and wife Savannah Brinson will undoubtedly be watching as her husband goes for his fourth NBA championship. The Cavaliers will appear in the first playoff game on Saturday, April 15 when they face off against the Indiana Pacers. Although they were dealt a recent loss at home by the Cavaliers, the Boston Celtics finished first in the Eastern Conference with a 53-29 regular season record. Their standing gives them home-court advantage to start the playoffs, and star players Isaiah Thomas and Al Horford will likely have their respective wives -- Kayla Wallace and Amelia Vega -- in tow throughout the playoff ride. All eyes, though, are on Oklahoma City Thunder's Russell Westbrook as he fights for what FiveThirtyEight's Kyle Wagner calls his "self-evident" right to this year's MVP award. Westbrook recently achieved a record-breaking triple-double average in a single season, and wife Nina Earl will most likely be present at games to see what other surprising feats her hubby can hurdle. "This playoff picture might shape into one the most exciting postseason we've witnessed in quite some time," writes Sports Illustrated's Jake Fischer. "There are question marks surrounding each power player on the chess board, especially in the Western Conference." Playoff play kicks off with four games on Saturday. One thing to know: The Blazers have had the fourth-best record in the league, with a hot offense and improving defense since the All-Star break. Unfortunately, the spark of that turnaround, Jusuf Nurkic, is out with a fractured leg, and the Blazers now get a hot and healthy Warriors team. It will take some heroic Damian Lillard performances to give Portland a chance. One thing to know: Since the All-Star break, the Grizzlies have gone just 9-15, and their trademark defense has been 20th in the league during that time frame. They went 1-3 against the Spurs this season and simply don't have the necessary wing strength to hang with San Antonio. One thing to know: Paul George has been on fire since the All-Star break, averaging 26 points per game on 49% shooting, 41% from three. The Pacers could normally feel good about any matchup with George on their side, but unfortunately, they get the Cavs in the first round, with LeBron James on the other side. George and James' double-overtime duel in April, with the Cavs eventually winning, could be an indicator of how this series will go. One thing to know: The Bulls, due to a blend of internal head-butting and bland basketball, have been uninspiring for much of this season. However, they've gone 10-6 over the last month, Jimmy Butler has had an All-NBA season, Rajon Rondo has had a late-season revival, and Dwyane Wade is healthy again. They split the season series with the Celtics and their size and one-on-one scoring could be a problem for Boston. One thing to know: The Hawks have gone just 11-15 since the All-Star break with a negative point-differential. They seemed on the verge of tearing it all down earlier in the year, but decided to keep their main core together. They lost three of four to the Wizards this season, and point guard Dennis Schroeder was well below his season averages in those contests. One thing to know: The Bucks have been the Giannis Antetokounmpo show all season, as the 22-year-old "Greek Freak" led the team in all five major categories. Such a formula may not be beneficial in the playoffs, as the Bucks may lack the depth to really put a scare into the Raptors. One thing to know: After a ridiculously hot midseason stretch, the Wizards cooled off after the All-Star game. Perhaps it was a bit of late-season malaise, but since the All-Star break, the Wiz have had the NBA's fourth-worst defense. Luckily for them, Atlanta doesn't have anybody who can stop John Wall and Bradley Beal. One thing to know: Russell Westbrook's late-season heroics have helped give the Thunder something to feel good about down the stretch, even if they masked some concerning near-losses to inferior foes. OKC lost three of four to the Rockets this season, but Westbrook played well, averaging 36-9-9 with 37% three-point shooting. Regardless of the outcome, the Thunder's size and physicality assures nothing will come easy for Houston. One thing to know: The Rockets have quietly struggled down the stretch, going just 9-6 over the final month while their defense slipped to 20th during that time. James Harden is battling a wrist injury and has shot just 42% in April. One thing to know: The story for the Jazz all season long has been health. In the games they've had their optimal starting lineup of George Hill, Rodney Hood, Gordon Hayward, Derrick Favors, and Rudy Gobert, they've gone 12-2. They took a huge step forward this year, thanks to improvement from Hayward and Gobert, but now they have to prove themselves in the postseason. One thing to know: The Cavs massively underwhelmed this season, winning just 51 games, the fewest for a LeBron team since 2007. There's still a belief that James and company can turn it on for the postseason, but their 12-15 record since All-Star and 29th-ranked defense during that stretch certainly leave room to worry. One thing to know: The Celtics have been one of the NBA's best stories in capturing first place, but now the pressure is on for the playoffs. They haven't won a playoff series with this current core, and they stood pat at the deadline, opting not to make a big move. Some feel a first-round exit would make the season a failure. One thing to know: The Clippers have underwhelmed for most of the season, but they started and finished hot, partially because that's when they've been healthy. Since March 13, they've gone 11-5 with the league's best offense and slightly below-average defense. The Clips have a lot to prove in the postseason, and they've been waiting all year to do it. One thing to know: The best record in the East since All-Star? The Raptors. And that's with Kyle Lowry missing significant time with a wrist injury. The Raptors are now healthy, their midseason acquisitions of Serge Ibaka and P.J. Tucker have paid huge dividends, and last year's conference finals appearance may have shaken off their postseason nerves. One thing to know: The Spurs are the Spurs. They won 50-plus games for the 18th season in a row, despite a weaker overall cast, thanks to Kawhi Leonard's MVP-worthy season and Gregg Popovich's brilliance. They also have an easier bracket, as they won't see the Warriors or Clippers (who they struggle against) until a potential conference finals matchup. One thing to know: Surprise! The league's best team has also had the best record over the last month, going 15-1 since March 13. Kevin Durant is healthy again, Stephen Curry is hot, and there's probably not a team in their conference who scares them. Simply put, with all of the Warriors talent, it takes a wild imagination to think any team could beat them four times in seven games.